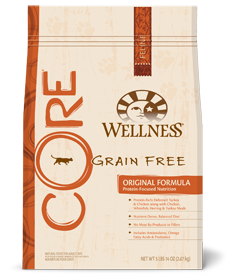 The CORE range from Wellness is a premium “grain free” offering, with a number of formulas including kitten and indoor. For this review I’ll focus on the Original formula, but the others are on par. Wellness have been around for a while, being available across the globe. They’re a big company, and are known to produce high quality premium foods. I see this as being the best food on the shelves at my local PetBarn. The top five ingredients are all meat and fish ingredients, which is absolutely fantastic. They’re excellent ingredients, being a combination of chicken, turkey, whitefish, and herring. There’s no ominous non-descriptive “poultry” or “fish” ingredients like we find in many of the supermarket brands. This is how a cat food should be, and the overall protein of 45% is testament to the amount of meat and fish in the food. We have peas as the 6th ingredient, another source of protein, and necessary fibre. In 7th we find yet another meat ingredient, turkey meal, as if the top five ingredients weren’t enough! Potatoes are included as a carb source, which is common in grain-free foods. Cats don’t really need carbs, but I estimate the carbs in the food to be a very low 18% which is really good. 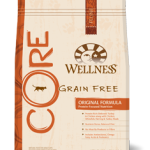 Flaxseed and salmon oil are both great for heart health, healthy skin, and glossy coat. This is without doubt a premium cat food, one of the best I’ve seen. Deboned Turkey, Deboned Chicken, Chicken Meal, Whitefish Meal, Herring Meal, Peas, Turkey Meal, Potatoes, Chicken Fat (preserved with Mixed Tocopherols), Tomato Pomace, Natural Chicken Flavor, Ground Flaxseed, Cranberries, Chicory Root Extract, Choline Chloride, Salmon Oil, Vitamins [Vitamin E Supplement, Niacin, Beta-Carotene, Vitamin A Supplement, Thiamine Mononitrate, Pyridoxine Hydrochloride, d-Calcium Pantothenate, Riboflavin, Vitamin D-3 Supplement, Vitamin B-12 Supplement, Folic Acid, Biotin, Ascorbic Acid (Vitamin C)],Minerals [Zinc Proteinate, Zinc Sulfate, Iron Proteinate, Ferrous Sulfate, Copper Sulfate, Copper Proteinate, Manganese Proteinate, Manganese Sulfate, Sodium Selenite, Calcium Iodate], Taurine, Mixed Tocopherols added to preserve freshness, Dried Kelp, Yucca Schidigera Extract, Dried Lactobacillus plantarum Fermentation Product, Dried Enterococcus faecium Fermentation Product, Dried Lactobacillus casei Fermentation Product, Dried Lactobacillus acidophilus Fermentation Product, Rosemary Extract, Green Tea Extract.